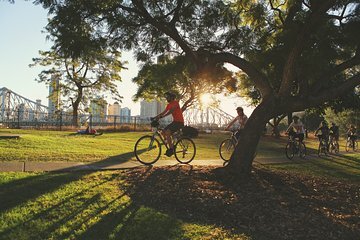 Take the scenic route along designated bike paths and avoid traffic as you explore Brisbane by bike. Your Brisbane bike tour starts near the Wheel of Brisbane at South Bank Parklands. Meet your guide, who provides a safety briefing, and hop on your city bike with your provided helmet. Then take off, following your guide past Streets Beach, a swimming spot that overlooks the CBD (central business district) and Brisbane River. As you pedal, listen to some tips from your guide about dining and entertainment hotspots you may want to visit during your time in Brisbane. Check out Kangaroo Point Cliffs, once quarried for stone in the 1800s, and listen to some of the history of Brisbane, dating back to the native Aboriginals. During your 2-wheeled exploration of central Brisbane, you’ll make stops to take photos and see key landmarks pointed out by your guide. See the Itinerary section for details on the three tours you can select from when booking—the 3.5-hour morning tour, 2-hour afternoon tour or 2-hour twilight tour. Your tour concludes when you return to the starting point in South Bank Parklands. Total biking distance may vary depending on the riding skills and interests of your tour group; your guide may adjust your biking route to suit all participants. Pass the sights listed in the tour description, and continue over the iconic Story Bridge to the charming suburb of New Farm. Ride down tree-lined streets and into New Farm Park, a gorgeous park with riverside picnic spots, cycling paths and playgrounds. Afterward, head over to Teneriffe to see heritage sites, many of which are being revitalized thanks to recent urban renewal initiatives. Gradually wind your way back along the waterfront near downtown, where some of Brisbane's finest riverfront restaurants are located. Pedal through the City Botanic Gardens, which boasts outdoor sculptures along with an impressive collection of native and exotic plants. This tour makes a short visit to a gallery or museum, schedule permitting. You'll also stop in a beautiful park for a morning tea break, with refreshments included. Your tour wraps up at the Brisbane Wheel. Start in the afternoon and cycle around central Brisbane and the river as described in the main tour description. Start in the early evening and catch the sunset as you wheel around central Brisbane and the river as described in the main tour description. Very nice tour. The guide was super friendly and was able to tell us a lot about the city. Biking wasn't too difficult. I would recommend it if you want to see a lot of Brisbane in a short amount of time. I could not finish the ride but my friend did and said it was a fantastic ride. I am rating on the equipment and the advertised tour which I thought were not up to par. Although the tour guide was knowledgeable and professional and quite nice there were some problems with the tour as advertised. The bike equipment was not in very good shape and made it difficult to handle pedestrian traffic. The route was more difficult than advertised and was quite dangerous for unseasoned riders. Excellent tour, you get to see things you dont see walking around or going by bus! Would recommend. Lovely way to explore Brisbane. Our guide David was a great guy and showed us some awesome places. PRICELESS 3-hour biking through the most beautiful sites of Brisbane. We passed the walkable bridge, along the beautiful river with beautiful houses and 20 million dollar historical house. Love the weather, love the routes, love Brisbane so much! We enjoy the biking as much as our 10-year old boy. It's not tiring as we stopped frequently under the shades. Learned lots of Brisbane city's culture....love it, love it and love it. Thanks David! Really good guide!! Good to do early on during stay ! !